Here we have the Multy trout in five colours & two sizes. The 4"/95mm model weighs in at a mere 16g while the 5"/120mm weighs in at 35g. Both cast well enough & have almost exactly the same action as their much more expensive cousins. Like their more expensive cousins they will both run just under the surface & can be worked right down to 2m or so. However there are some manufacturing differences, these Jaxon ones have moulded monochrome eyes, unlike the ITT version, which has inserted/stick on holographic eyes. These have black chromed split rings which may or may not rust in time, the ITT ones have Stainless steel. 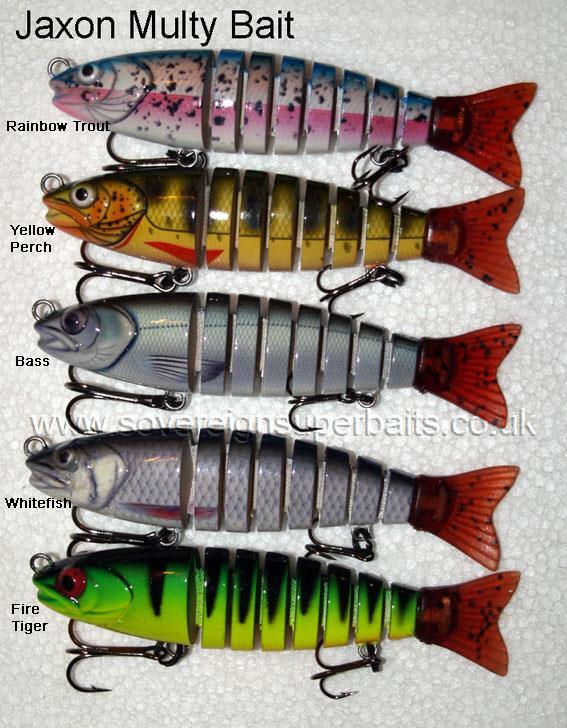 These Jaxon ones have VMC hooks, while the ITT has Owners & last but not least, while the paint on these Jaxon ones is very good, it is not in the same class as the ITT "Real fish" transfers, but these are half the price ! So you pays your money & makes your choice.